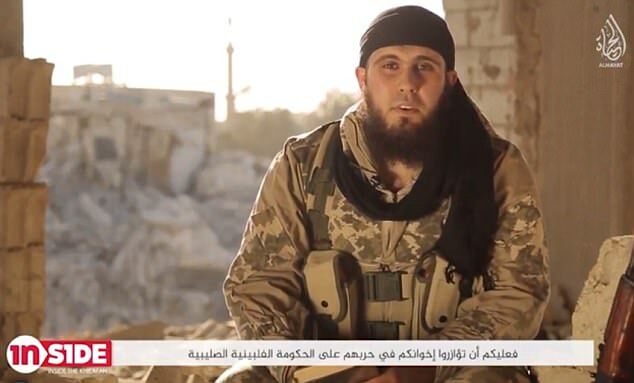 An Australian jihadist in Syria has issued a propaganda video urging attacks on the Philippines. Mounir Raad, now known as Abu Adam al-Australia, also urges Islamic State supporters to use petrol, nail guns and trucks to target civilians in Australia. The former Melbourne resident is seem among the rubble of Raqqa as the net closes in on IS in the Middle East. Raad calls on Muslims in Australia to join the fight in the Philippines and attacks the Australian government for assisting in the Marawi conflict against his ‘brothers’. “As for those of you who can’t make it to this battle [in Syria] … in particular to the Mujahideen [holy warriors] in Australia, then you should go aid your brothers in the fight against the crusader government of the Philippines,” he said. Today (Tuesday, August 8) it was announced that the Australian government is donating about 800 million pesos to help rebuild the war-torn Islamic city of Marawi. Raad also said that if Australian Muslims could not make it to the war zone, they should bring bloodshed to their home. “Make the lands of the Crusaders your battlefields,” he said. The then suggests “weapons of choice” for would-be jihadists, encouraging the use of petrol, nail guns and trucks to “burn them in their homes”. The video, titled Inside the Khilafah 2, shows Raad sitting in a destroyed building with an AK-47 rifle slung over his shoulder. Raad has been fighting in Syria since 2014 and is related to extremists jailed over the 2005 plot to bomb the Melbourne Cricket Ground. The Australian aid for Marawi, which has been overrun by terrorists since May 23, was made by Foreign Minister Julie Bishop on the sidelines of the 50th Association of Southeast Asian Nations (ASEAN) meeting in Manila. The announcement came after Mrs Bishop met with President Duterte yesterday – their second meeting to focus on the Marawi crisis. The Australian foreign minister said Australia’s support would provide child protection and counselling services for the estimated 360,000 Marawi residents forced to flee their homes. She added that it “will also fund small-scale infrastructure projects for communities around Marawi including provision of clean drinking water and repair of local roads”. Aside from this, Australia “will assist community peace-building efforts and strengthen local capacity to resist and counter extremism”. Australia has also announced it will help the Philippines by flying P-3 Orion surveillance and intelligence flights over Marawi. The video can be viewed via MailOnline.